"Readers are compelled to jump in." "Delightful!" "Exuberant" "Not to be missed!" 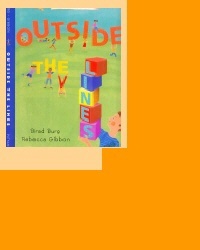 Outside The Lines: Poetry At Play received this award from The Bulletin of the Center for Children's Books (BCCB). It was one of only 11 children's books selected in that category for the year. "Sparkling synthesis of text, layout, and art." "There’s some calorie-burning reading here." "Bouncier but no less interesting than Janeczko’s A Poke in the I, this will give kids a chance to leap into poetry." Evocative poetry [whose] words flutter and roll, soar, circle and bounce on the page, in poems about softball, kies, fireflies, soccer, Hula Hoops and other happy subjects. "Twenty-two poems that just won't sit still." ". 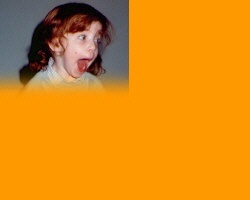 . . language is consistently simple and accessible, infused with the childlike exhilaration of the moment at hand." "Burg's poems make it impossible to stand off to the side and observe. Readers are compelled to jump in." "Energy is as hard to resist as the enticing red, gold, and orange mound in 'Leaf Pile,' which can't be ignored, despite Dad's order to 'keep things neat.' . . ."
"The adventurous verses try everything from kite-flying to castle-building. Young readers will . . . appreciate the way their experiences can be preserved on the page. Ages 5-up. "In a tour-de-force, one of Burg's briefest poems puts words to the act of looking at sky and ground while rolling down a hill: "Green/ green/ blue/ blue/ green/ green/ blue/ blue/ dandelion!/ green/. . . "
Language Arts (the journal of the National Council of Teachers of English). "A cohesive visual experience through which readers gain as much from the design of the illustrations as from the clever layout of the text in offering concrete poetry." "The acrylic paintings complement the text perfectly and enhance the comprehensibility of the poem. Readers will have an opportunity to reflect on each poem and think about how it relates to the games played in childhood." "An imaginative, interactive collection ... a feast for the eyes and ears." "Perfect for youngsters 5 and older." "A marvelous introduction to 'concrete' poetry, and a fun-filled masterpiece of creativity, not to be missed." "A delightful glimpse into a child's world of play." "Poems shaped like a game of catch, tag, or a jungle gym will fascinate the reader. Rebecca Gibbon's lively watercolor illustrations splash across the pages and complement the unique construction of each poem. Children in Grades 3-5 will enjoy this immensely!" ". . . [A] rolling, swinging, skipping, bouncing book of 'poetry at play' ". "Gives playful shape to ordinary childhood experience." "The opening poem, 'Catch,' works rhythmic mischief and perfectly captures the cadence of a ball flying between two mitts. Single syllables are split into two neat columns so that the eye must travel back and forth across the page . . . The poem reveals 'THE / SLEE- / PY / SOUND / OF / SUM- / MER'S / CLOCK.' "